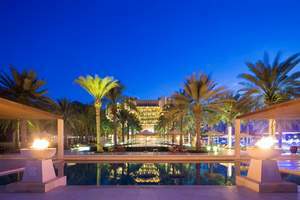 MUSCAT, OMAN--(Marketwired - Jun 1, 2016) - Al Bustan Palace, a Ritz-Carlton Hotel, has created a host of exclusive offers to commemorate the Holy Month of Ramadan, including a tantalizing Iftar buffet with a signature show-cooking chocolate station, a special room package to enjoy throughout the season, and a Garangao celebration to remember for children. This Ramadan, Al Bustan Palace gives a sweet twist to one of the most renowned Iftar buffets in town, with a delectable chocolate-themed station showcased during Iftar at Al Khiran Terrace throughout the season. Chef Joergen Sodemann and his culinary teams have partnered with Salma's Chocolates, an Omani label which emerged out of the passion and talent of two creative minds, Salma and Aisha, who produce some of the finest handmade chocolate creations in Muscat. The two entrepreneurs, voted best SME in the Gulf countries in 2015, find their inspiration in local products and flavors to create their delicious treats available at their Muscat showroom. This season, the talented ladies have imagined three delectable chocolate creations exclusively for guests of Al Bustan Palace. 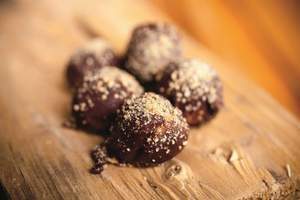 Mouth-bursting espresso shots (bite-sized chocolates filled with espresso caramel heart), coconut white chocolates or date caramel truffles will be offered on the Iftar buffet at Al Khiran Terrace, offering an innovative take on the traditional fast-breaking ritual. Each evening during Iftar, the live-cooking chocolate station will also offer Ramadan juices and smoothies revisited by Salma's chocolates, as well as succulent signature ice creams with Salma's toppings, including innovative flavors such as rose water caramel or date syrup. The culinary teams at the luxury hotel in Oman have created a mouthwatering selection of dishes to offer families an Iftar buffet to remember. Live cooking stations will feature Ramadan favorites such as Shawarma, Manakish or Lamb Ouzi; the all times favorite Arabic Mezze corner will delight all palates, alongside some refreshing, colorful displays of salads and cold dishes, while seafood lovers will delight in the baked whole Hammour. Adults and children alike will succumb to the sweet temptation of the traditional Arabic sweets, Um Ali and the exquisite Salma's chocolate station to conclude the feast. Sohour will be served in the spectacular Ramadan Tent in the gardens of Al Bustan Palace, with a-la-carte suggestions and selections of shisha to extend the night to the sound of the kanoun players, until dawn. The students of the Al Bustan Culinary Academy will launch the Ramadan celebrations on June 2nd, as they take part in a culinary challenge and compete to showcase their cooking skills. The students, currently in their second year of practice in the kitchens of Al Bustan Palace under supervision of Executive Chef Joergen Sodemann, will team up to create their version of a local-inspired Molton Chocolate Cake with homemade ice cream. The competition will be judged by Salma's Chocolates experts, Salma and Aisha themselves. The winning recipe will be added to the Iftar buffet each night during Ramadan to delight guests and visitors at Al Bustan Palace. Children are also part of this holy season and will be invited to attend a memorable Garangao evening, traditionally organized on the 14th day of Ramadan in celebration of their efforts in fasting throughout the holy month. Al Khiran Terrace will host an entertaining night for children, including games, a parade, and many other delights. Additionally, The Ritz Kids team will be on hand at the luxury resort throughout the summer to entertain the little ones, with activities such as henna painting, arts & craft, and watersports, offered to children of all ages. A sumptuous Eid-Al-Fitr buffet will welcome families at Al Khiran Terrace on the second day of Eid, to mark the end of the holy month. Families will celebrate a blessed Eid Al Fitr around a grand buffet of Arabic and International specialties in a festive ambience. For families looking to experience summer at the Muscat beach resort of Al Bustan Palace, the "Better Together" summer package is available with an exclusive offer to stay 3 nights when you pay for 2, including three overnights in a luxurious room or suite, complimentary wifi, and exclusive savings on the hotel restaurants and luxury spa treatments. 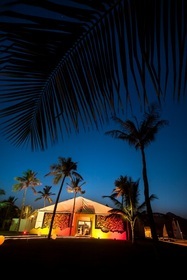 *The free night will be reflected as a 33 percent savings on each night. The Ritz-Carlton Hotel Company, L.L.C., of Chevy Chase, Md., currently operates over 90 hotels and resorts in the Americas, Europe, Asia, the Middle East, Africa, and the Caribbean. More than 30 hotel and residential projects are under development around the globe. For more information, or reservations, visit the company web site at www.ritzcarlton.com. The Ritz-Carlton Hotel Company, L.L.C. is a wholly-owned subsidiary of Marriott International, Inc. (NASDAQ: MAR). Ramadan Nights will be memorable this month at Al Bustan Palace, a Ritz-Carlton Hotel, on the beachfront of Muscat. Chocolate is the star of the buffet this Ramadan at Al Bustan Palace, a Ritz-Carlton Hotel. Guests will delight in the magical ambience of the Ramadan Tent at Al Bustan Palace, in Muscat.